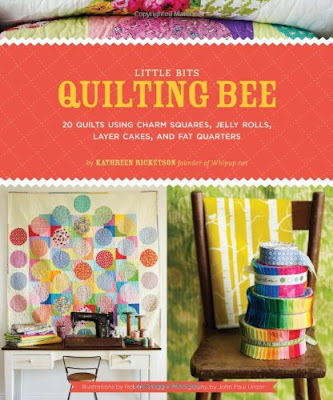 I am not a quilter, I have made a couple of quilts but I am still very much in the novice quilting section but this year I want to try something a bit more challenging, so getting Quilting Bee by Kathereen Ricketson for Christmas was perfect! The quilts are all modern looking and fresh and use precut packs such as jelly rolls and layer cakes, sounds tasty yeah? Using these takes the headache out of accurate cutting. I love the way that the quilts are marked by difficulty too, of course when I flicked through the book I immediately picked out one of the most difficult! I will have to work up to that. Kathreen clearly explains the different techniques and terms. 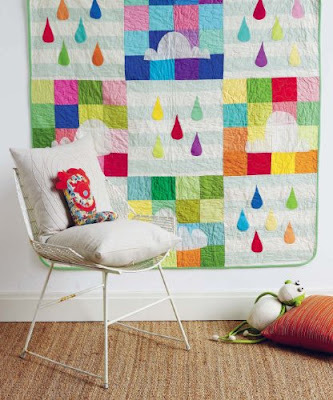 It has everything in the book that a quilting newbie needs. I also love the fact that there is a pocket at the front of the book to keep the pattern pieces in. 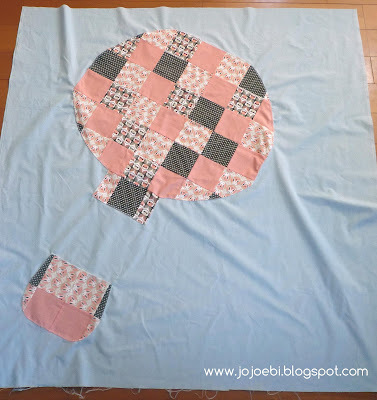 So, last month my step sister had a baby girl, perfect excuse to pick one of the patterns from the book so I went for Aloft (pg55), I really wanted to use the pink and brown 'forest friends' Cloud 9 fabrics that I had but I had already cut into some of them, so to be able to use it I had to re size the squares from the original pattern, mine are a little smaller and have an extra row. This is the only semi-decent photo I have, I snapped a picture of the finished quilt then packed the quilt up and sent it off to Greece THEN checked the photo and it is all fuzzy aghhh! So you will have to use your imagination on what the finished item look like. The directions were easy to follow, even for me, one of those people with an inability to follow directions usually! and the dimensions are given in cm and inches, one of my gripes about books aimed for the American market. If you are thinking of giving quilting a go, I can highly recommend Quilting Bee. If you want to know more about Kathreen, then pop back tomorrow to read an interview with her.